Though I’ve been quiet here for a few days, I have been working on a couple projects. One of them is a Black Legion Chaos Sorcerer that is the second part of my Call of Chaos vow. I think I’m enjoying the challenge more this time. Probably because it looks like I’m actually going to finish the vow! So this is an old Chaos Sorcerer miniature, one of the metal ones. I actually have a couple of these models. With the increased power the Sorcerers have due to the new supplements, and the ability to take several of them, thanks to the formations, I figured it was a good time to paint them up. With the above model, I decided to go with a similar color scheme for his robe and helmet decoration as I did with the Chaos Lord’s cape. I used Shining Gold as the base color for the metal trim, with a wash of Reikland Fleshshade and a highlight of Liberator Gold. The bone I did with base of Screaming Skull, a wash of Agrax Earthshade, then a dry brush of Screaming Skull again. That was followed with a very light dry brush of Skull White on the most raised edges. That was the first time I’ve tried dry brush over wash and I think it turned out nicely. On the force sword, I used a base of Regal Blue, followed by highlights of Enchanted Blue then Ice Blue. 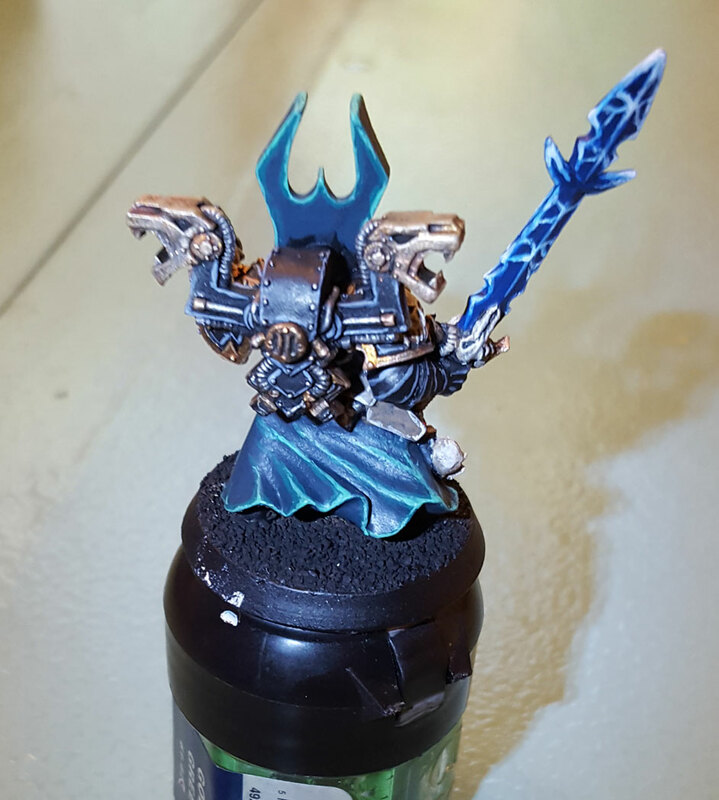 Then a sort of edge highlight in certain areas with Skull White. I tried to do some voltaic arc effects with Ice Blue and Skull White. They didn’t turn out as well as I would have liked, so it’s a technique I need to practice on more. On balance, though, I’m liking how the mini is turning out. I admit I’m being a little conservative with the painting here, but I am trying to get this one done somewhat quickly. I’ve got some other stuff in the pipeline with which I will try to experiment, techniques-wise, a little more. Mainly here, I’m excited about finally completing a vow. 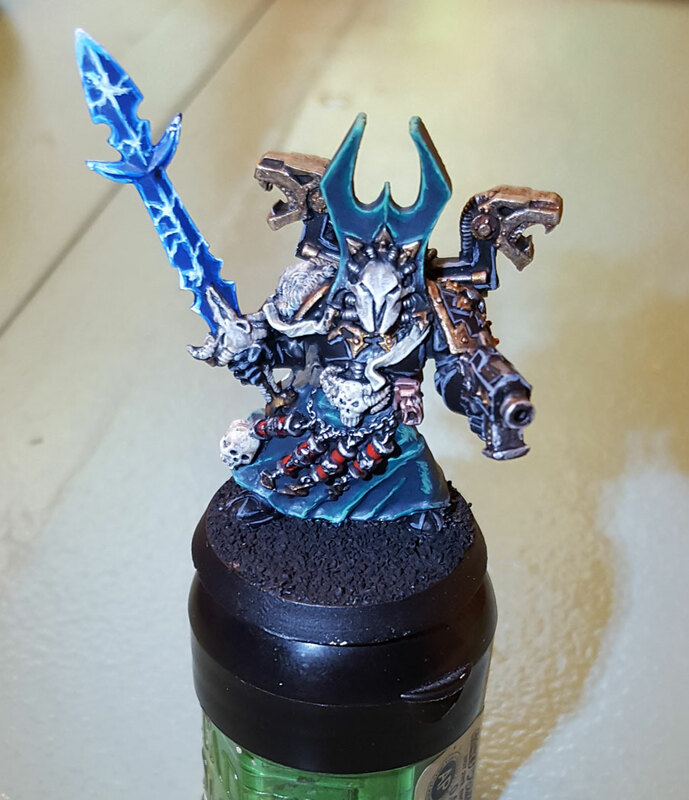 ← Black Legion Chaos Lord finished!